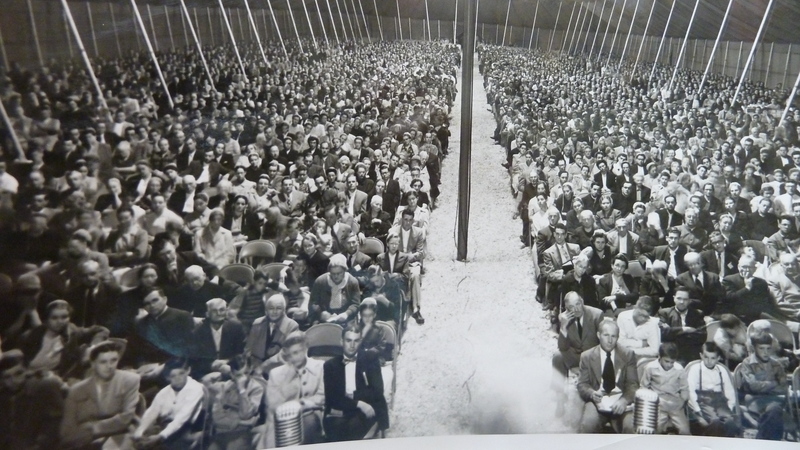 Why I had to apologize and restore harmony with the dean of the seminary goes back to this sawdust trail, spread down between these long rows of chairs on a flat Indiana farm. A reader of my Another Way newspaper column, Pauline Yoder Kauffman, who knew my family, once sent me this photo, which I treasure. Why? Because it includes my paternal grandparents, Uriah and Barbara Miller, sitting in the second row, pretty much the way I remember them throughout my growing up days as they lived in the “daughty” house attached to our home. I’ve written in this space of how Grandpa was just 6 generations removed from his ancestor, Jacob Hochstetler, featured in the new novel, Jacob’s Choice. 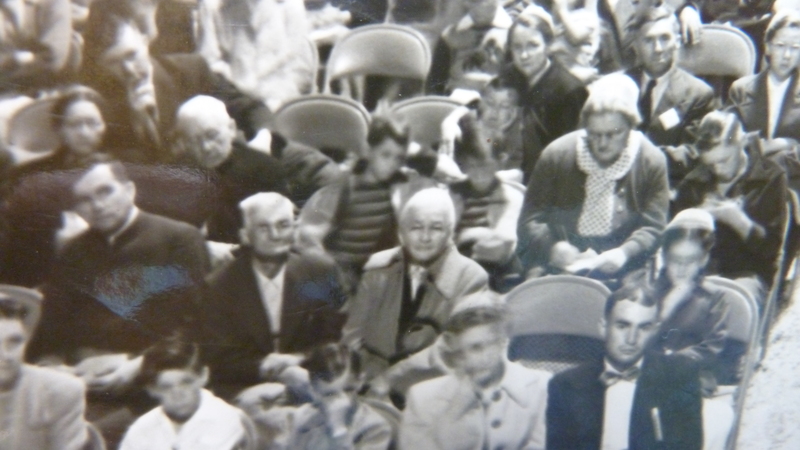 Grandpa Uriah M. Miller and Grandma Barbara Kauffman Miller, second row. He has a coat without a tie, and she has a jacket on. Persons who attended every night of a Brunk revival received a free Bible. Grandpa and Grandma got a Bible. (I don’t know if it was one copy or two.) They were already in their 80s. But the tent here is what astounds me as I look at this photo. Look at all those support poles, way back. Other sources say the tent held roughly 6,000 people. Crowds of 17,000 with overflow tents in some communities are mentioned in other sources. Here the tent looks pretty well filled. That is a lot of people in the small communities where the tent was set up—not dense or urban population areas. People drove from miles around. Sometimes the meetings went as long as 3-4 weeks. That Grandpa and Grandma were there every night kind of blows me away. The night I went forward I remember watching one of my school mates who was a year younger than me. He went forward first and I thought, if he can do it, so can I. I was emotional of course and my pastor and his wife, I think, joined me in the private area behind the stage to pray with me and support me in that step. I don’t remember exactly how my parents reacted but I’m sure my father said something like “We’re very happy you went forward, Melodie” and that was pretty much the extent of it because we didn’t talk about a lot of deep personal things. I didn’t know what else to say. My sister may have went forward too but that’s her story, not mine to tell. I was baptized several years later. So in my senior year of college when I wrote the yearbook essay on Eastern Mennonite Seminary mentioned in my last blog post, and George II as dean of the seminary was not happy, I ruminated on that for about two years. I would see George around town or the campus and wondered if he remembered the incident, if he recognized me as the writer of it. I had not intended anything ill or offensive, but I was made in such a way that I wanted to apologize. To me what I wrote was not a sin, but something had come between us. I once wrote a letter of confession and apology to a family whose bathroom scales I broke and had lied about it; in the same way, these bad feelings weighed on my heart. I finally sent George a letter, apologizing, and asking for forgiveness if I had brought any mar on the reputation of the seminary. In the note I mentioned how as a child I had responded at one of his tent meetings, and how that had been an important marker on my faith journey. Maybe my letter was not necessary, but I felt a lot better after I sent it. In due time George sent a conciliatory response. All was well. There was no bad blood, no bad feelings. One of my cherished mentors, Ruth Brunk Stoltzfus, the first ordained woman in Virginia Mennonite Conference, was a sister of George, an ordination he definitely opposed. In her memoir, A Way was Opened, she speaks some of her relationship to her brother. They had some family fences to mend, too. I was happy to have taken care of my unfinished business when he died at the age of 90. My compulsion was somehow connected to my grandfather and his grandfather and his grandfather before him (and on back) and how we are taught to not only seek peace with our brothers and sisters as mentioned in my last blog post, but to do good, especially “among those who are of the household of faith.” Galatians 6:10. For more history of the Brunk Revivals, check here. Did you ever apologize just because you knew you would sleep better if you did so? Did you walk the sawdust trail or “go forward” at an evangelistic meeting? What do you remember? Thank you again, Melodie, for continuing this fascinating story. I particularly appreciate the details of the Brunk tent revival campaigns and the link to their memorable sister Ruth B. Stoltzfus, who was brave enough to speak out so eloquently during this “silent” era. Have you had a chance to read Ruth’s memoir? A strong memory related to her book (but unrelated to its content) is that the morning of Sept. 11, 2001 when the planes were hitting the World Trade Center, she was sitting in my office going over with me some of the issues related to organization of her book and getting some feedback. We emerged from that meeting to a changed world. Funny the stuff you remember (and the stuff you forget). I’m enjoying the blog format to share some of these more personal things that the readers of my Another Way column likely would not get or care about. Thanks for traveling along, and the stories you share! No, I haven’t read her memoir, but I have saved the link today for later reference. I can learn a lot about my own history from you. Thanks, Melodie!